WWI Profile: John Hillery Caison 1895-1984 | Friends of Fort Caswell Rifle Range, Inc.
John Hillery Caison was born and raised in Brunswick County, NC. His younger brother, James Cline Caison, and brother-in-law, Herman Dan Fulford, also served in WWI. There is a partial family tree in FamilySearch. His WWI Draft Registration card shows he was single, living in Supply, and working on the family farm. John was ordered to report for duty on May 27, 1918, along with 36 other men from Brunswick County [Source: Ancestry]. Included in the 36 were Jesse Lee Fayette Inman, David Bertram Frink, and Zade McLoud Williams (NC WWI Service Record not found). All four were sent to Camp Jackson, SC, to train with the 81st Division, but transferred to the 42nd Division in August. John Hillery Caison and Jesse Lee Fayette Inman became replacements for Company A, 168th Infantry, 42nd “Rainbow” Division. Jesse’s WWI Profile will follow this one next week. David Bertram Frink was assigned to the 166th Infantry and Zade McLoud Williams to the 167th Infantry, both with the 42nd Division. During the 42nd’s rest in Bourmont area, changes were made. General Douglas MacArthur had been made a Brigadier General and placed in command of the 84th Infantry Brigade, which included the 167th and 168th Infantries. Pvts Caison and Inman served in the 168th. The men from the 168th were originally National Guard members from Iowa. With ranks depleted from the heavy fighting, replacements had to be accepted. Note: Rosters of Brunswick County veterans and Organizations of the Divisions can be found on the World War I Army/Marine Division Roster webpage. Excerpts below taken from The Story of the Rainbow Division, source listed at bottom. Replacements, those freshly arrived, untried soldiers at whose advent the veteran survivors of hard battles look askance, and without whom no division could continue its career as a division, came to the Rainbow in great numbers. The gaps in the ranks were filled. Lost and battle scarred equipment was replaced by new, up-to-date fighting material. The Rainbow Division, in a sort of new Camp Mills, having found its fighting spirit in the field, now was being made over—getting its second wind, so to speak. The WWI Profile of Herbert Burnell Ward (5th Division) described their next battle. It was the first all-American operation of the war: St. Mihiel. Fourteen American divisions were gathered for the operation: 1, 2, 4, 5, 26, 42, 82, 89, 90; Reserve: 3, 35, 78, 80, 91. The Rainbow Division had started forward on August 30. Moving always at night and resting during the day in inconspicuous places (for the attack was to be a surprise) it marched about one hundred and twenty kilometers to the Foret de la Reine. There it went into camp in shelter tents. It became a division of mud-dwellers, lying quietly in the sticky black muck all day and wallowing about in it through the night, for by daylight no movement of men or transportation was permitted. Rain fell steadily and the roads became horrors. Through the downpour and the absolute blackness the men of the 117th Supply Train and the 117th Ammunition Train struggled forward inches at a time with the deep mud sucking their trucks back and the pitch-dark roads seeming to fall away beneath them. Nearly always about twenty-five per cent of all the Rainbow’s transportation was stalled impotently in the mud and wrecking crews were at work day and night. The attack began on September 12. Brunswick County men Pvt Jimmie Griffin from the 2nd Division had been killed by sentry the night before, while Cpl Herbert Ward from the 5th Division was KIA that day. The Germans were taken by surprise. Intelligence found on captured prisoners showed that the Germans did not expect the attack during the rain, and that they considered it a rather mean thing to do—an advantage that would not have been taken by the French and British. The Germans retreated to the Hindenburg Line, which they thought was impenetrable. It too would be defeated soon. Under constant fire from the German artillery, the Rainbow Division remained in place, sending raiding parties out to keep the Germans unaware of the Army’s plans elsewhere. The 42nd remained in the area until October 1. Pvt Caison was severely wounded on September 23, while the Division remained in the area. It appears that he did not return to combat. During the operations, Pvt Caison’s 168th Infantry reported 61 KIA, 30 Died of Wounds, and 289 Wounded. Pvt Inman was also wounded during these operations (WWI Profile to follow this one next week). 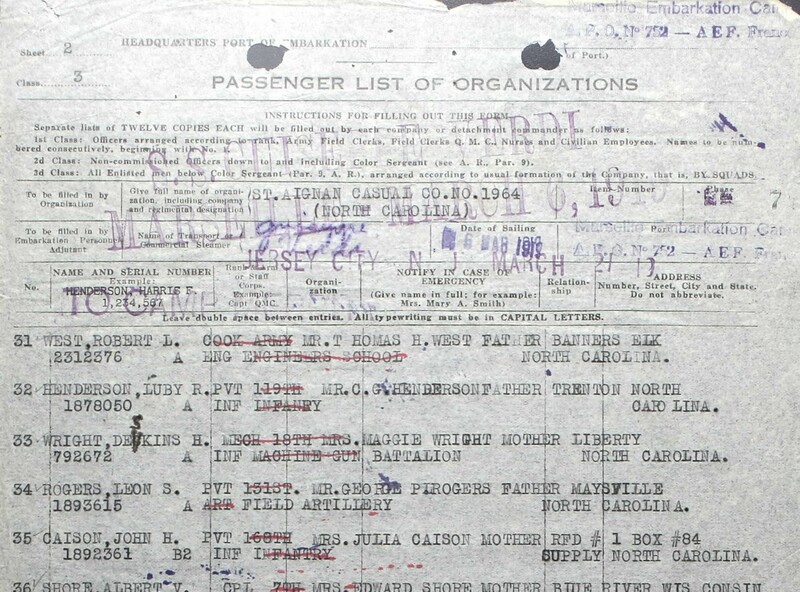 Pvt Caison returned to the US with other casualties from North Carolina on March 6, 1919, from Marseille Embarkation Camp, as shown in the passenger list above. There are no details of his severe wound or if he was recovering from that one or a new illness/injury, but his status is indicated as “B2” which means he could no longer serve in combat. That seems to indicate his injury was disabling but there was no disability at discharge reported on his NC WWI Service Record. According to the 1920 Census, John returned to Lockwoods Folly to the family farm. When his father died, he remained with his mother (1940 Census). There is no record of him marrying. 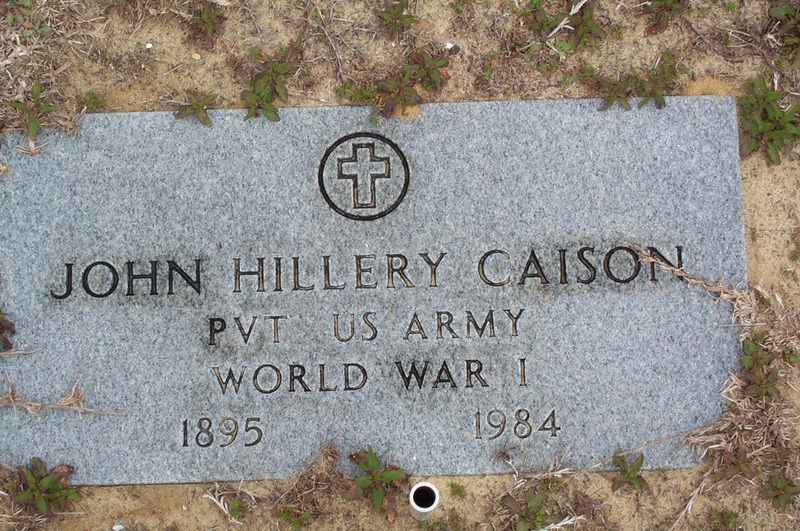 John Hillery Caison passed away in 1989 and was laid to rest with his family in Holden Beach. A military flat marker is shown. Reilly, Henry J. (1936). Americans All, The Rainbow at War:Official History of the 42nd Rainbow Division in the World War. Columbus, OH: Heer. Sherwood, Elmer W. (1929). Diary of a Rainbow Veteran. Terre Haute, IN: Moore-Langen. Thompkins, Raymond S. (1919). The Story of the Rainbow Division. NY: Boni & Liveright. World War I American Battle Monuments Commission (1944). 42d Division Summary of Operations in the World War. Washington DC: GPO.